and keeping our subdivision residents up to date with news and events concerning our community. Notice: 2019 HOA Dues drive is underway. 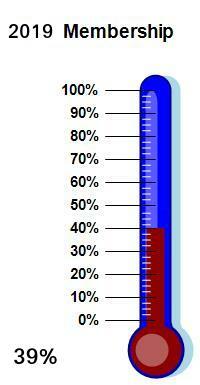 Please submit $100 annual dues to continue CHHO operations. See letter below for more info. April 19 Someone attempted to break into a home owners truck last night, Friday 04-19 on Prairie Drive.. The sheriffs office was contacted and a report has been filed. All of the vehicles were locked. They tried to punch out the door lock causing damage to the truck. Update: March 28, P&Z voted to recommend to the council to deny approval of the rezoning application on Triple B Road. Thanks to the participation of the residents of Comite Hills and neighboring homeowner and also special thanks to the Planning & Zoning Commission for listening to the concerns of the citizens. Link to the Planning and Zoning meeting on March 28. The rezoning item begins at time marker 13:30 on the video. Planning & Zoning Meeting tonight - March 28. Kristenwood. 6:00PM. All homeowners are encouraged to attend. Hope that you've enjoyed a healthy, joyous, and safe holiday season! Now is the time to get down to business and address past and present resolutions. In that vein, we want to provide you with information...regarding the activities of the current, acting Board of Directors for CHHO. The most time consuming activity has centered around the Security Camera System that we last addressed with you in the Spring of 2016 newsletter. Shortly thereafter, as we all experienced, our community was catastrophically impacted by a major flood. On Aug 13, 2016, residents of Comite Hills and many homeowners in Central were totally disrupted by the Great Flood of 2016 with many in our subdivision catastrophically impacted. Residents have been recovering since that flood with priorities focused on family and City recovery. This Board did not feel it appropriate to hold a dues drive while so many were directly and indirectly affected by those events. We can now return to more normal activities. At our last meeting in April 2016, a proposed security camera being considered was discussed. This meeting was poorly attended by residents. Since community recovery, the Board began actively pursuing new estimates, info, etc. regarding a Security Camera System. This has been a slow and arduous process. A process that has taken longer than we wanted it to take!! Much time has been required to get a location secured on a homeowner’s property -- so camera will catch activity from the Triple B/ Sullivan Rd. entrance. Time delays were experienced with Entergy - City of Central and IBTS. Continuous meetings were held with all involved. This was not a simple undertaking; there was much to be considered. We now have a complete system to propose. Being ready to setup the site, purchase equipment, etc., we find ourselves SHORT of the necessary dollars to pay for this; the system decided upon is going to cost $7500.00. Remember, no dues have been collected for 3 years. (Current balance is $4,956.00 in CHHO checking account). The money in CHHO's treasury has had some obligations all of this time: water meters for circles, checking account fees, care and mowing of some circles. It is bare necessities folks. If we want more, and this writer believes many would like to see more in CHHO, contributing to a safe, welcoming community with wholesome social activities (such as egg hunts, progressive dinners, neighborhood garage sale, Santa's ride, etc.) then NOW is the time to search your hearts and ante up. Dues will remain at $100.00 dollars per household. Donations of additional dollars are always welcomed, small fees may sometimes be necessary to participate in functions from time to time. More importantly, we need the help of individuals to serve CHHO, as volunteers for office and the board of directors; committee members; handling functions such as: keeping website current, etc., and organizing activities. 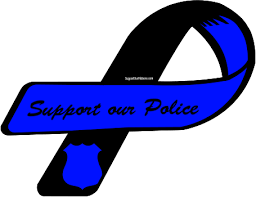 These things do not happen without the efforts and service by dedicated individuals. We are organizing a membership meeting for Comite Hills Homeowners Organization at the Central Branch of the EBRP Library, located on Joor Rd. on Wednesday MARCH 27, 2019. The meeting will be held at 6:30 to 7:30 P.M. We will take time to cover what is proposed for in the Security Camera system; collect dues (cash or check); take names for volunteers wishing to serve as Officers in CHHO, Filing Captains, and committee members. We hope to see someone there from every household. We will send a reminder to all email addresses prior to the meeting. Please go to www.comitehills.com to register your email address. The Board of CHHO thanks you for your patience and looks forward to working together to secure and improve our community. Mar 8, 2019. 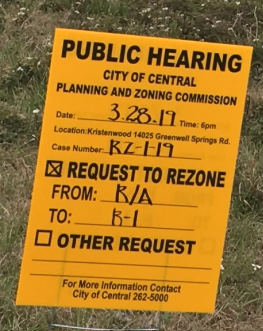 There will be a rezoning hearing on March 28 @ 6:00PM at Kristenwood, regarding the property located at the beginning of Triple B road behind the shopping center. Link to the Planning and Zoning agenda (pdf). The 2 lots proposed to be rezoned to R-1 and subdivided into 4 lots total are marked with a red border in the image below. Aug. 23, 2017 A reminder that Central City has a leash law regarding dogs and cats. It has been brought to the attention of CHHO that there have been incidents of dogs attacking other pets and frightening neighbors who choose to walk in our neighborhood. Animal Control has the authority to "impound all dogs or cats which are found running at large in the streets or roads or public or private property in the city" per Central City Municipal Code Sec. 3:24. Check this link for more info. Pet owners should also respect their neighbors by utilizing "dog waste bags" when walking their pets. Jun. 13, 2017. City of Central Office has been contacted regarding the two blighted lots on Triple B behind Chase bank. 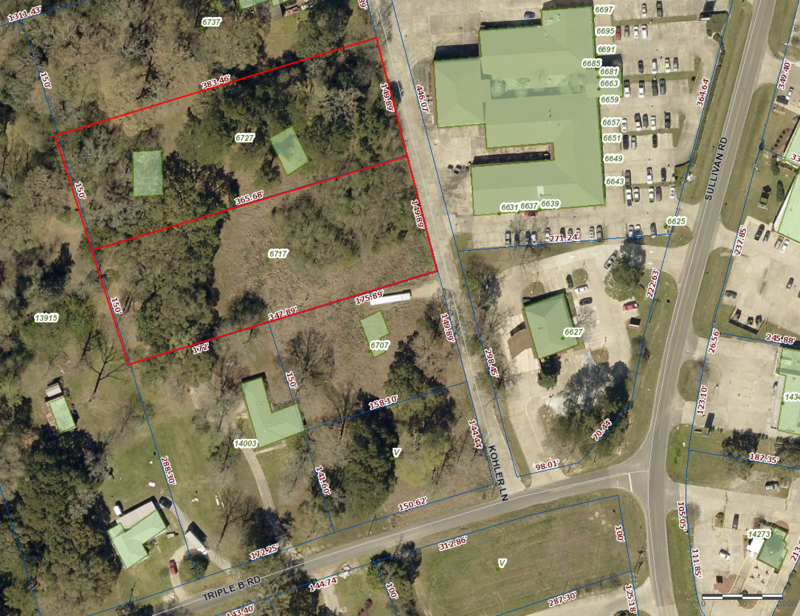 April Meeting of Federation of Greater Baton Rouge Civic Associations featured a study performed by Lake Sherwood Acres subdivision on forming a gated community. *** Cost to maintain streets, drainage, and sewer were prohibitive. *** Cost to maintain gates for emergency access, deliveries, utility access were high. *** Would need approval by metro council and DPW. Doubtful that it would be approved. *** Always open to legal contests. *** Required high approval by residents. *** Streets would be owned by individual residents and would require maintenance. *** A partial gate solution has been undertaken by a subdivision in Ascension parish but many of the same burdens as full gate are there. September Meeting of Federation of Greater Baton Rouge Civic Associations featured guest speaker Atty. Wade Baumgartner. Mr. Baumgartner spoke about CA restrictions and enforcement thereof. *** Act of Restrictions have the highest precedence of authority, including the La. Homeowners Act. *** A neighbor who has violated a restriction (e.g. erected a building which violates restrictions), does not set a precedence, meaning a neighbor next door can be held responsible for violating the same restriction, including responsibility for lawyer fees, and court costs. *** Restrictions are easily enforceable in court of law. *** Obtaining approval from city P&Z does not cover CA restrictions. They are separate & CA restrictions can have precedence. *** To avoid costly errors please check CHHO restrictions.